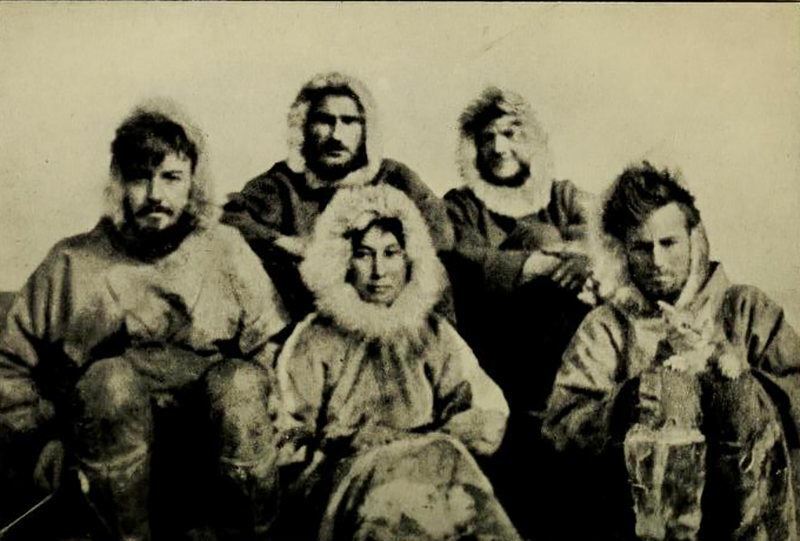 Ada With the Men on the Expeditionhttps://www.atlasobscura.com/articles/ada-blackjack-arctic-survivor (INTERNET ARCHIVE/PUBLIC DOMAIN)Imagine you are stranded on a frozen island. Alone. Chilling winds sweep over you. Holding a weapon which you have never even touched before. Never even dared to touch. Attempting to hunt something that fate warns you against. Almost going insane from isolation. Marking off your 700th day, stranded on this desolate wasteland (Siber). However, you are still going strong. You must survive. She must. A poor woman, transformed into a true heroine. She is a forgotten hero, Ada Blackjack. The determination to survive, even as insanity, starvation, hypothermia and the fear of getting mauled by a polar bear lash out at her, came from her son. Her whole life, dedicated to making his life better, better than hers. Ada Blackjack was a poor woman with a shy personality. Less than five feet tall, barely a hundred pounds, and with no survival skills (Siber), she spent most of her life battling poverty and illness (Caravantes). 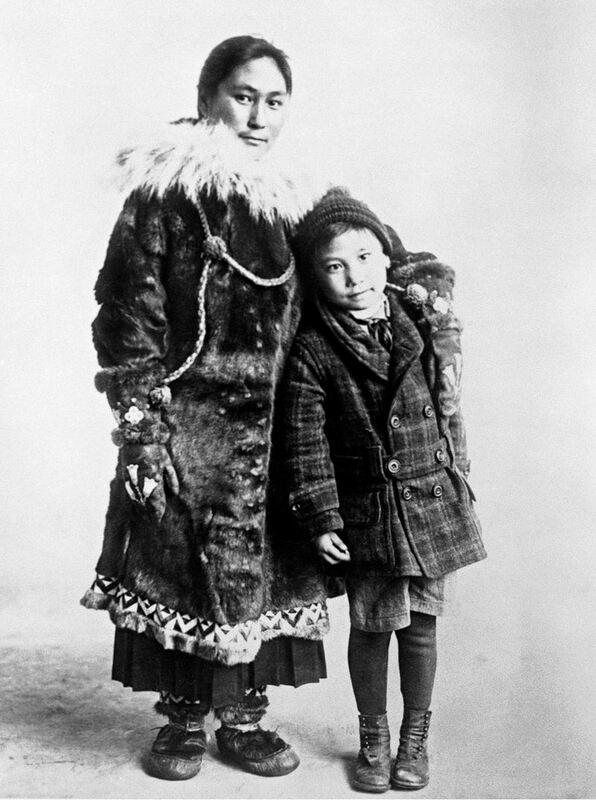 In 1921, Ada signed up as a cook and seamstress on an Arctic expedition in order to earn money to treat her son’s tuberculosis. She spent the rest of her life searching for jobs and healthcare for him (Siber). 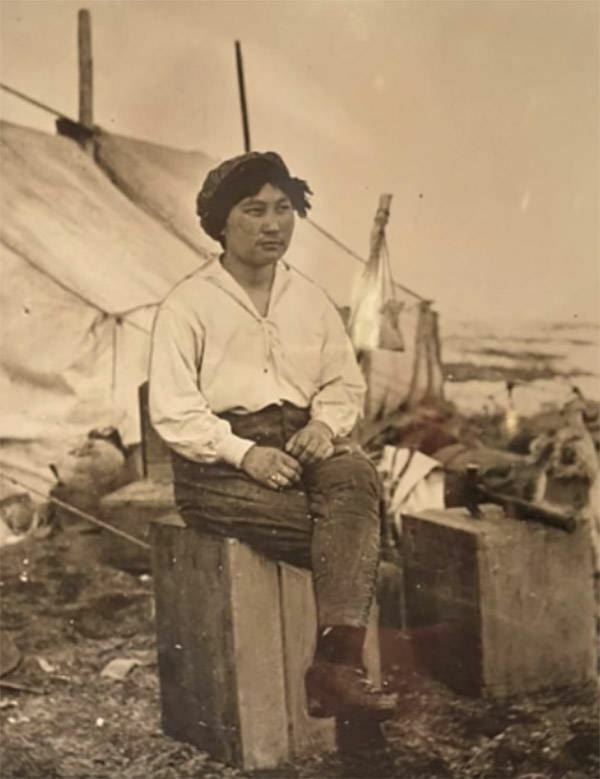 However, when conditions turned dire during the expedition, her maternal instinct fired up, allowing her to persevere through and see her son again ("Ada Blackjack: a True Story of Survival in the Arctic." ). Her actions juxtapose her background, showing heroic qualities such as courage and perseverance. Ada Blackjack showed great adaptability, selflessness to help and save others, as well as her defining unstoppable determination, making her nothing less than a true hero. “This transformation of the timid young woman is the heart of her story—the only time when she was consistently actor rather than acted upon. She learned to trap foxes and taught herself to shoot, although terrified of guns...A relief party in late August found a woman with "the look of a hunter" (Niemi). In two months, Ada overcame her fear of guns and polar bears, and transformed into a “hunter”. By the time she was rescued, she already had already adapted quite well to life in the Arctic, doing something in two months that most people couldn’t even do in a lifetime. “...the only time when she was consistently actor rather than acted upon”—Ada became the one who “controlled” what happened, instead of just being a humble servant. When she became alone, she had to learn, on the spot, how to survive: “Ada’s later ingenuity in making a boat and a kerosene stove contrasted sharply with the men’s inaction" (Caravantes). Ada was much more flexible than even professional men that were specially recruited for this dangerous journey, as shown by the word “ingenuity”. This flexibility later proved crucial to survival on the island, fighting to stay alive. Ada was amazingly adaptable and was able to adjust to her surroundings by herself, surpassing even professional men when it came to fighting for survival. 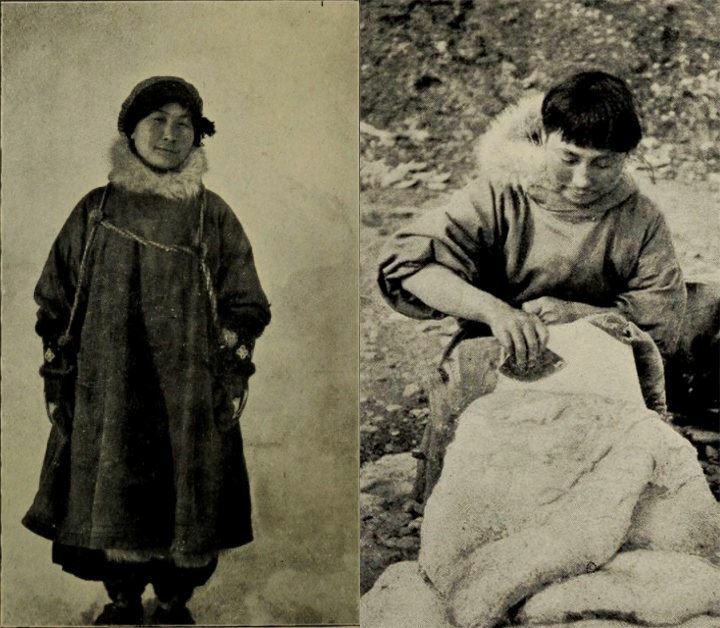 “But the odd jobs of sewing and housekeeping she was picking in Nome were never going to be enough to bring Bennett home, and the Wrangel Island expedition promised a salary of $50 a month—an amount that was, to Blackjack, an unheard-of sum" (Hulls). “...Mrs. Fletcher realized that it was Ada’s love of Bennett that had kept her striving to stay alive on Wrangel Island no matter how difficult it was. It was her maternal instinct that made her determined to get back to Nome and now to venture to a strange state to help her son...Her ongoing motivation for all she did was the care of her first son, Bennet, who suffered from multiple illnesses" (Caravantes). Ada’s son, Bennet, gave her the mental strength to stay alive as she was determined to save him because of “maternal instinct”. In addition, not only did she go on a dangerous trip to earn money, but she also moved from state to state, trying to find better jobs and healthcare for her son. Ada’s only motivation to go on this risky trip was because of the high salary that could get healthcare for Bennett. This shows that she was willing to sacrifice everything for him to lead a better life. “Panicked, alone with four strange white men on a desolate island, she slid into "Arctic hysteria." She refused to work, developed a romantic passion for the nice Canadian boy; she ran away, perhaps suicidal. The young men, at a loss how to handle "the native," tied her to a flagpole; they laughed at her howls of despair. Still, Ada recovered, and the first year passed relatively well.”(Niemi). “After Knight’s passing, Blackjack refused to fall into despair and instead threw herself ferociously to the task of surviving in order to be reunited with her son...The dying man projected the rage he felt over his helplessness onto her, criticizing her constantly for not taking better care of him. Blackjack did not outwardly allow his blows to land, but confided in her diary, ‘He never stop[sic] and think how much its[sic] hard for women to take four mans[sic] place, to wood[sic] work and to hund[sic] for something to eat for him and do waiting[sic] to his bed and take the shiad [s***] out for him’" (Hulls). Despite this mental torture, she still stood strong, forcing herself to stay alive and care for Knight no matter what obstacles she faced, as she was extremely determined to get out of the frozen wastelands, and return alive to still be able to care for her son. This determination makes her stand out against ordinary people. While she was stranded on the island, Ada had to hunt to stay alive: “By trapping foxes, hunting seals and dodging polar bears, Blackjack fights for her life and for the future of her ailing son..." ("Ada Blackjack: a True Story of Survival in the Arctic." ). She faced many threats to survival, such as her greatest fear, polar bears, and freezing temperatures. However, her resilience to stay alive, provided by the thought of Bennet’s suffering, kept Ada alive and gave her the instincts and capability to do whatever she needed to stay alive. Ada’s extraordinary determination in making it back to Alaska alive to see her son again makes her stand out among ordinary people, making her a true hero. Ada was worthy of a true hero due to her flexibility to learn on the spot, her care for others through self-sacrifice and of course, the unmatched determination that kept her alive in the most harsh of environments. Ada’s unconditional maternal love was what persuaded her to go on the journey, as it promised a high salary to fund Bennet’s healthcare. However, when she gets stranded, her adaptability, fueled by determination to stay alive for her son, kicks in and transformed her from a tiny, shy woman to one with “the look of a hunter” (Niemi). “‘The Female Robinson Crusoe,’ was the only member of the party still alive—that is, apart from Vic. The shy tailor with the crippling fear of polar bears had taught herself to shoot and trap to stave off the constant threat of starvation, and when she strode out to meet her rescuers in a resplendent reindeer parka she had stitched herself, her gaunt face held a “triumphant smile”(Hulls). She was a bit proud of herself when she survived, fighting through her worst fears, shown by the “triumphant smile” as she realized that she, as a mother, had done all this for her son, and that he was the power that pushed Ada forward relentlessly. You can imagine how Ada felt at this moment. Imagine you are Ada. Would you do this? Would anyone do this? She was not even reluctant. She did not even care that she might die at any moment. She was undeterrable. “Ada Blackjack Johnson’s life began in poverty and ended in poverty…On her own, she learned to shoot a shotgun and a rifle, how to set animal traps, how to skin, dissect, and cook those animals, and how to stretch her meager food supply to enable her to stay alive. Her ongoing motivation for all she did was to care of her first son, Bennet, who suffered from multiple illnesses”(Caravantes). Despite these heroic deeds, fate was not on her side, and she still lived a life that she did not deserve, that no one deserved—but she did not care. She only cared about her son. "Ada Blackjack: a True Story of Survival in the Arctic." Publishers Weekly, 22 Sept. 2003, p. 94. Biography In Context, https://link.galegroup.com/apps/doc/A108788649/BIC?u=powa9245&sid=BIC&xid=69b7ac09. Accessed 15 Jan. 2019. Caravantes, Peggy. Marooned in the Arctic: the True Story of Ada Blackjack, the "Female Robinson Crusoe". Chicago Review Press, 2016. Hulls, Tessa. “Ada Blackjack, the Forgotten Sole Survivor of an Odd Arctic Expedition.” Atlas Obscura, Atlas Obscura, 8 Dec. 2017, www.atlasobscura.com/articles/ada-blackjack-arctic-survivor. Niemi, Judith. "Because it's there." The Women's Review of Books, Mar. 2004, p. 10+. Biography In Context, https://link.galegroup.com/apps/doc/A114520378/BIC?u=powa9245&sid=BIC&xid=387c58fc. Accessed 14 Jan. 2019. Siber, Kate. “The Inuit Woman Who Survived the Arctic Alone.” Outside Online, Outside Magazine, 13 Sept. 2018, www.outsideonline.com/2274756/inuit-woman-who-survived-arctic-alone.